Technologies around transportation are evolving rapidly. Staying current is difficult enough for professionals in the field, let alone for young people or the educators who prepare them for post secondary education and to choose their career path. Through a unique project, a suite of lesson plans teaching concepts from intelligent transportation systems (ITS) and connected vehicle technologies has been developed for middle school and high school students. 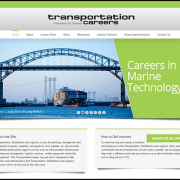 The plans connect educators with the latest technologies and expose students to a modern vision of careers in the transportation industry. “What kids see in terms of highway workers is a bunch of guys with trucks and shovels. But, we’re doing coding and robotics and communications. There’s a difference between the current perception and the vision of what’s going to come in the future as things are automated and as technology improves, and as the ways that transportation systems are developed, designed or maintained change,” said Richard Claus, Chief Executive Officer of NanoSonic, a company specializing in advanced materials and devices headquartered in Pembroke, Virginia. NanoSonic is one of very few high-tech companies in a very rural area. Located near a local middle school, the people of NanoSonic were routinely asked to visit science, math or chemistry classes. Four years ago, the Federal Highway Administration (FHWA) sponsored a Small Business Innovation Research (SBIR) contract to develop lesson plans around intelligent transportation systems and connected vehicle technologies. The company’s leadership saw this as an opportunity to get more formally engaged with the education system. They were awarded the contract and began collaborating with engineers from the U.S. Department of Transportation’s ITS Joint Program Office’s Professional Capacity Building (ITS PCB) Program and Leidos and with educators from local schools. Since the initial project, the company was also awarded another contract for a second phase lasting two years, which is coming to a close, now. “The contract required us to develop twenty lesson plans. We’re up to about sixty-five, now,” said Claus. 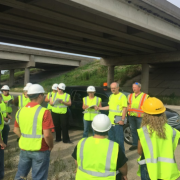 A recently developed lesson plan involves students in the development of clothing that will keep highway maintenance workers safe by sensing when traffic is too close. From the initial set of lesson plans, the ideas have continued to evolve and grow. One of the plans most recently developed has students utilize e-textile fabrics with embedded sensors and actuators. In this exercise, students develop clothing that will keep highway maintenance workers safe by sensing when traffic is too close. In addition to getting the students to think about how close a vehicle can be to a person without putting them in danger, the activity provides experience assembling electronics, learning about how the sensors work, and programming the devices. Lesson plans were field tested through a STEM afterschool program serving middle school and high school students. Now in its third year, the program has reached many students, some of whom have returned year after year. Sensors in the fabric to be used for highway worker clothing. Transportation is a good field for engaging with students of this age group, according to Christina Martin, who serves as the Giles County STEM Education Program Coordinator. “Students are excited about driving; it’s something they can see themselves doing in a few years. It’s fun for them to think about how vehicles are going to change. They see some of the connected applications that already exist on vehicles and they can start to imagine what that progression is going to look like in several years,” she said. The company has also helped create a regional science fair, launched a Transportation Engineering Summer Camp, and initiated a summer work program for high schoolers. 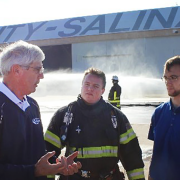 “We think it’s our civic responsibility to be part of the community,” said Claus. However, he does point out that the company has had one direct benefit from the work they have done with the schools. 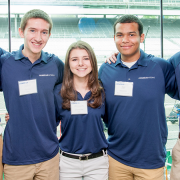 Through a summer work program for high school students, NanoSonic has hired one person as a full-time, permanent employee. To view and download the suite of free transportation lesson plans, visit the Education page of the NanoSonic website. Questions related to the plans can be directed to STEM@nanosonic.com .